PEAK Wellness Center helped this man achieve his goal of walking his daughter down the aisle at her wedding. ENGLEWOOD, Colo. – Until three years ago, Jim Stamps’ regular workout did not include high-tech equipment like the RT600 and the Alter-G treadmill. “I wasn’t a weekend warrior particularly, but I think I was a fairly active for a guy in his mid-60s,” Jim said. Jim was diagnosed with Guillain-Barre syndrome, a rare but serious autoimmune disorder where the immune system attacks healthy nerve cells. His biggest concern wasn’t that the disorder had robbed him of his ability to walk. It’s what that could potentially mean a few months further down the road. Exercise specialist Kaci Hudson knew Jim could achieve that goal when they started working together at Craig Hospital’s PEAK Wellness Center. PEAK stands for Performance, Exercise, Attitude and Knowledge and it’s where Jim began his journey to walk again. 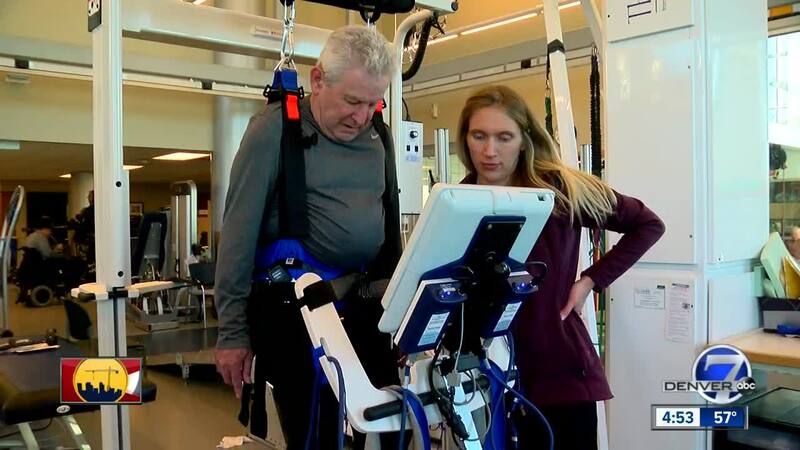 “It’s really him and I working together,” Kaci said while working with Jim on the RT600, which makes him look something like a robot with pads electrically cuing Jim’s muscles to move at the right time as he walks. Therapists at PEAK help patients achieve their goals both big and small. “I had a woman just the other day tell me for the first time she didn’t think about standing up and brushing her teeth. She just did it independently,” Kaci added. For Jim’s rehab, he also used the Alter-G, an anti-gravity treadmill that allows patients to work on their walking or running form while only supporting a fraction of their body weight. Cameras around the treadmill show them their strides from different angles. “I can cue him and show him that his right foot isn’t advancing as far as his left,” Kaci said. Jim no longer uses the wheelchair he was in the first day he came to the PEAK Center and he hopes to soon be rid of crutch and cane, too. “I don’t believe we left a dry eye in the house,” he said.